- For next few weeks, the child will learn that how Jesus loves those around us. 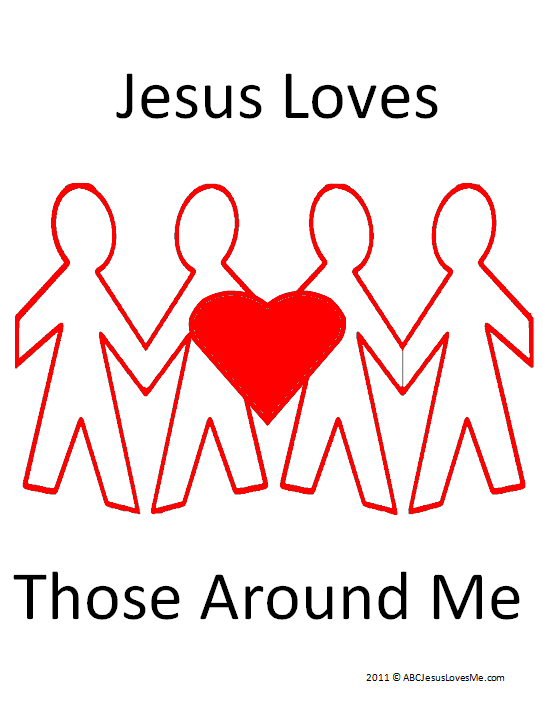 Collect all of the activities and crafts to form a "Jesus Loves Those Around Me" book. At the end of the study, a cover worksheet will be provided to bind the pages together. 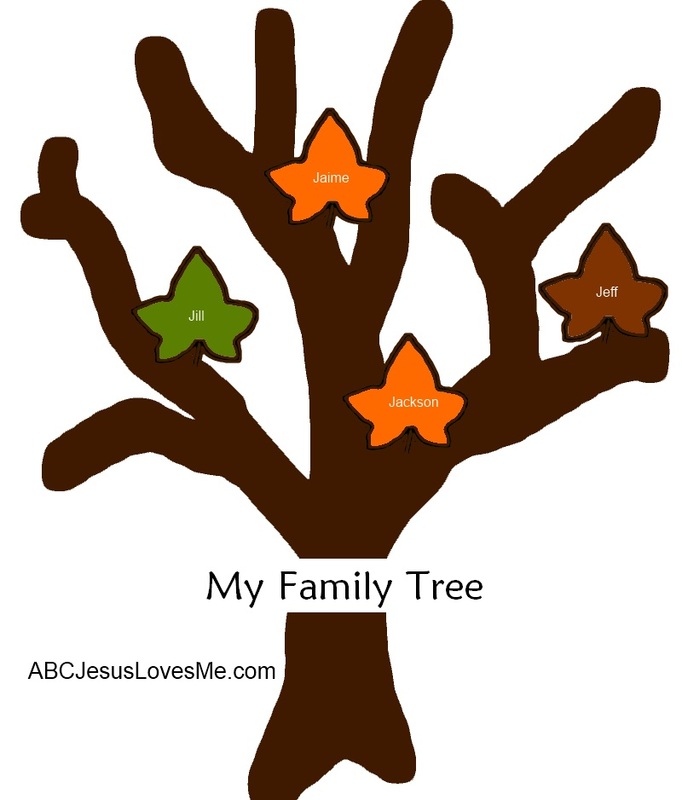 - Using the My Family Tree worksheet, color and cut out as many leaves as the child has people in his immediate family. Write the name of each person on the leaf and glue on the tree. - From the Family worksheet, cut the number and sizes of people needed. Glue onto a piece of construction paper. Add clothing, faces, and hair to represent each person. Write the person's name under each figure. - Look through family scrapbooks and pictures. Use words like "aunt, uncle, cousin, brother, mom, etc." - Play "family" with dolls. Switch places and let the child be the mom or dad during play time. Use red, orange, yellow, green, and blue blocks or Legos to build a structure. Talk about each color as you build. Break and glue spaghetti pieces on the outlines of the Square and Diamond worksheet. Paint the spaghetti to form the shape. This week paint with watercolors the Apple Tree #10 worksheet. After drying, add ten apple stickers. Continue to count items throughout the day. Depending on how restless the child sleeps and the placement of the child's bed, this task can be relatively easy or pretty difficult. Teach the child to start with the bottom sheet and work up to the pillows. Help the child but do not discourage the child by redoing their efforts. - When the child has heard the book a couple of times, stop and let the child finish the rhyming word or phrase. 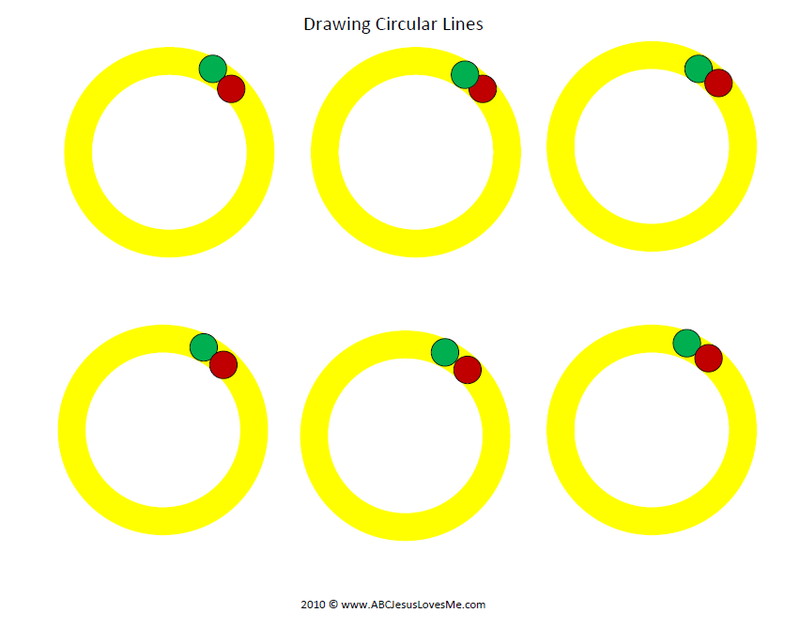 While holding a pencil correctly, trace circles on the Drawing Circular Lines worksheet. Help the child place the pencil on the green dot, draw along the yellow, and stop at the red dot. Say "go" and "stop" when on the corresponding colors. Some children will not be ready for this activity and that is okay. Continue to work on fine-motor activities to increase the child's fine motor control.